CARPOPHORUS, EXANTHUS, CASSIUS, SEVERINUS, SECUNDUS, and LICINIUS, soldiers martyred (circa 295) in Como in the north of Italy under Maximianus Herculius Augustus. According to one legend Carpophorus and Exanthus, were members of the legendary Theban Legion. DONAT (DUNWYD), (Date Unknown), according to the English Menology St. Donat is the patron saint of St. Donat’s, or Llandunwyn, in the Vale of Glamorgan in Wales. There is no further information on his life extant. DONATIAN, (Date Uncertain), a disciple of and successor to St. Memmius (5th August), and second Bishop of Châlons-sur-Marne in France. DONATUS and HILARY (HILARINUS), (Fourth Century), St. Donatus, the second Bishop of Arezzo, and St. Hilary, a monk, were martyred under Julian the Apostate. St. Gregory the Dialogist (3rd September) amongst others have attributed numerous miracles to these saints. DONATUS, a Frankish aristocrat, baptised by St. Columbanus (23rd November). He received monastic tonsure at the Abbey of SS. Peter and Paul of Luxeuil, and in time consecrated Bishop of Besançon. A great supporter of monasticism, St. Donatus founded a monastery of St. Paul in Besançon. He is also known for the Regula Donati , a monastic rule he wrote for the community founded by his mother after she was widowed. St. Donatus reposed circa 660. FAUSTUS, though there are no particulars of his life extant, tradition has it that he was a soldier who was tortured and eventually killed for the Faith in Milan during the reign of Commodus (180 – 193). PETER, JULIAN, and COMPANIONS, though listed in all of the ancient martyrologies, no details of their lives are extant. SS. Peter, Julian, and Companions are said to have been a group of at least twenty martyred in Rome under the persecutions of Valerian and Gallienus circa 260. VICTRICIUS (VICTRICE), the son of a Roman legionnaire who followed his father into military service. 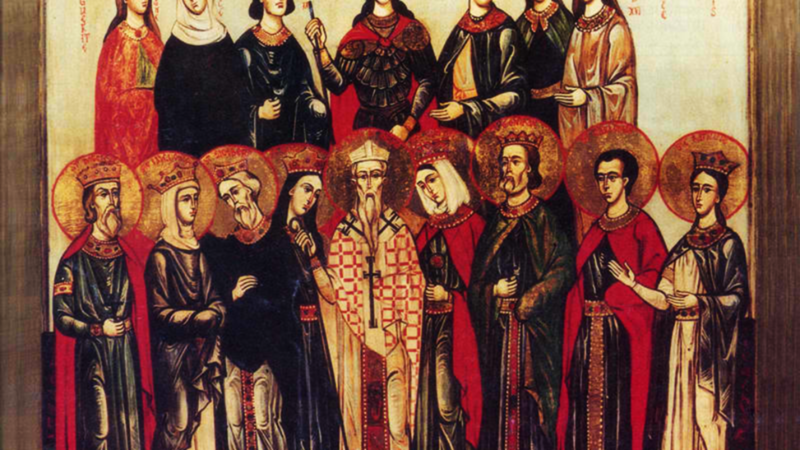 However, after becoming a Christian, St. Victricius found military service incompatible with his Faith, and refused to continue his military service. He was flogged and sentenced to be executed, however the sentence was not carried out and he was discharged. St. Victricius became a missionary evangelising the people of Flanders, Hainault, and Brabant. He was consecrated the eighth Bishop of Rouen circa 386 or 393. He was, at one point, accused of heresy, and was defended from that charge by Pope Innocent I. St. Victricius was also known as an author and his works include De Laude Sanctorum , a short sermon he in 396 to welcome a gift of relics from St. Ambrose of Milan (7th December). St. Victricius reposed 417.